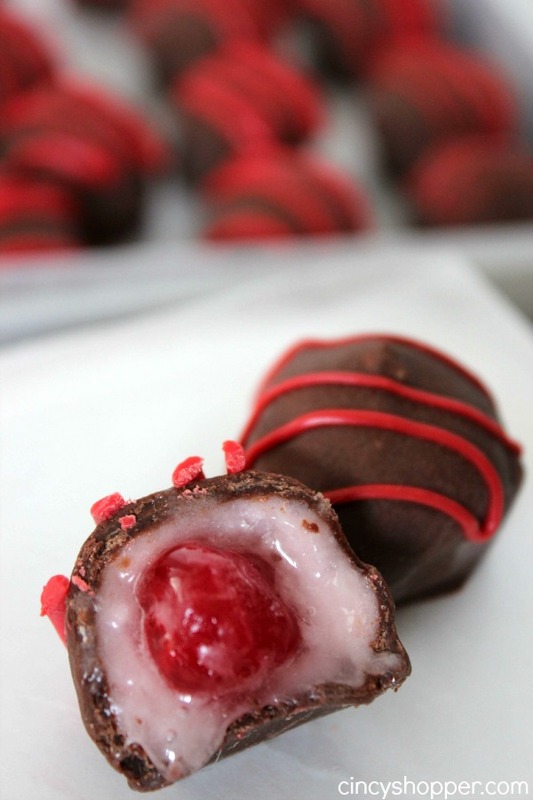 Achieving a gooey Chocolate Covered Cherry just takes time and patience. Yes, they take days but they are well worth it when they are at their prime. My cherries always look like that box of holiday chocolates (holes in the bottom from checking the filling) ha ha! The hubby can not wait for them to finish and is constantly checking them. 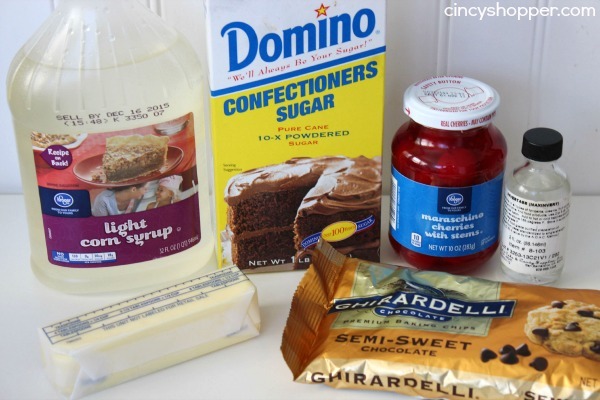 The ingredients needed for homemade chocolate covered cherries are very simple. In the past I have made our homemade chocolate covered cherries without the Invertase they just took longer to get nice and gooey. 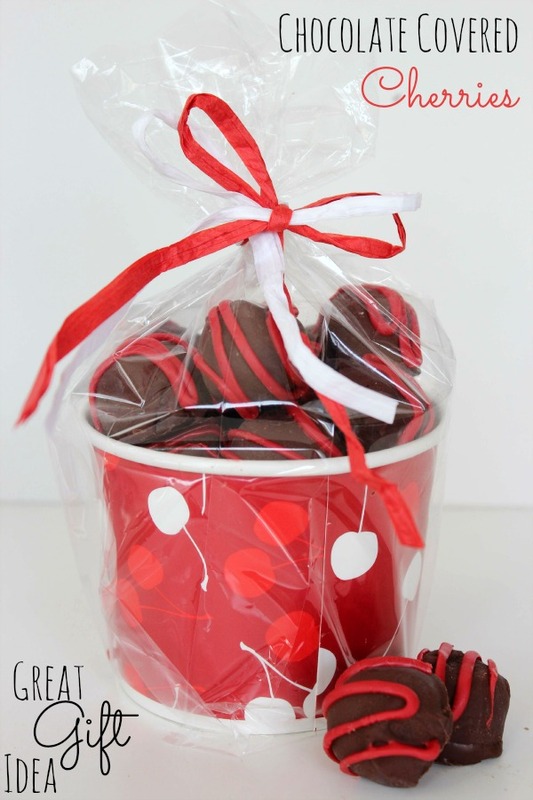 If you are needing a gift for a candy or chocolate covered cherry fan you can make up this recipe and toss it in some cute packaging to gift. I had these adorable cherry cups that I picked up on clearance. I wrapped them up and gifted a batch to the neighbors. PERFECT! Form into i/2" balls and flatten. Place a drained cherry in the middle and wrap to completely cover cherry. Roll to round out ball. Return to prepared sheet. What a nice recipe! Where can I find Invertase? Thanks! I was lucky enough to get mine at a Cake Store down the street. They sell all kinds of supplies and make cakes, too. I’ve seen it on Amazon, too. 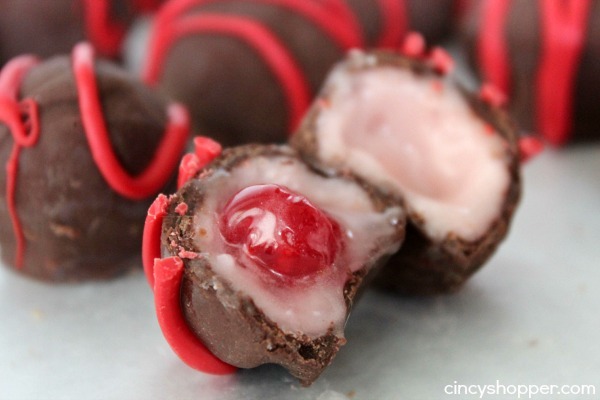 I love Chocolate Covered Cherries, and this recipe looks so easy! Pinned! 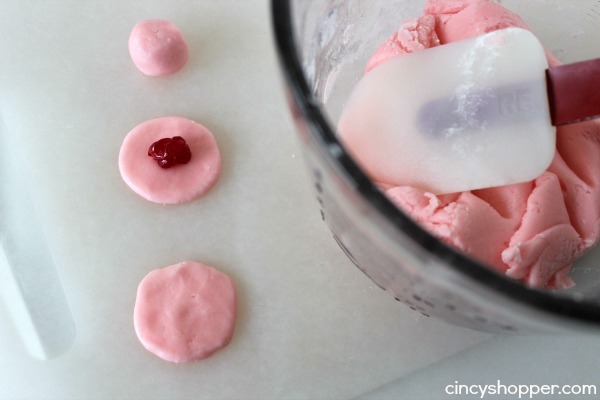 I will have to hunt down that invertase so I can make these. 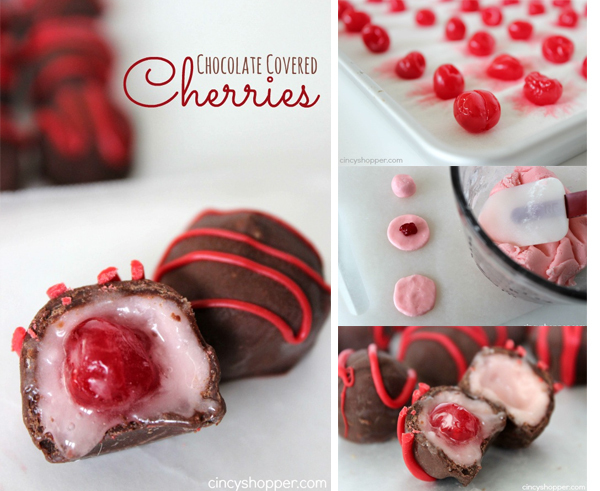 I just love Chocolate Covered Cherries, these look great! Thanks so much for sharing your awesome post with Full Plate Thursday and hope you are having a great day! where can I find invertase? Sooooo trying these. Always Breen my Mom’s favorite, so making them especially for her!! I’ve made Choc. 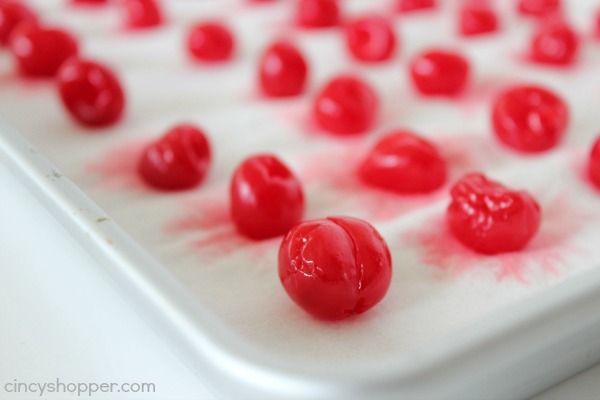 covered cherries for years..My recipe is is the same other than the invertase. It’s not necessary to use invertase. Infact I’ve never heard of it…Homemade choc covered cherries are so much better than store bought… they are worth all the trouble! Do you let yours sit like mentioned above and for how long since you don’t use the invertase. I want to make some but don’t want to track down the invertase. Thanks! I ave made homemade chocolate covered cherries for over 10 years. My recipe is the same but without the inverted, which I’ve never heard of. I make them for Christmas and make them several weeks before Christmas and keep them in the freezer and they get liquidy the longer you let them set and if you keep them in the freezer they last for a couple of months and still taste delicious. I make them every year at Christmas and I usually make about 300 of them and they all get eaten. Mmmm!! My Hubby is a “superfan” of Chocolate Cherries!! I will definitely add these to my Holiday goodies list! Have a couple of questions though. Where do I find Invertase, and when the cherries are “sitting”, is it just at room temp? Thanks so much for sharing this recipe!! I can’t wait to make them! My father used to make these at Christmas time for gifts. He actually made many different kinds of creamy hand dipped chocolates. Thank you so much for sharing this recipe and bringing back wonderful memories. 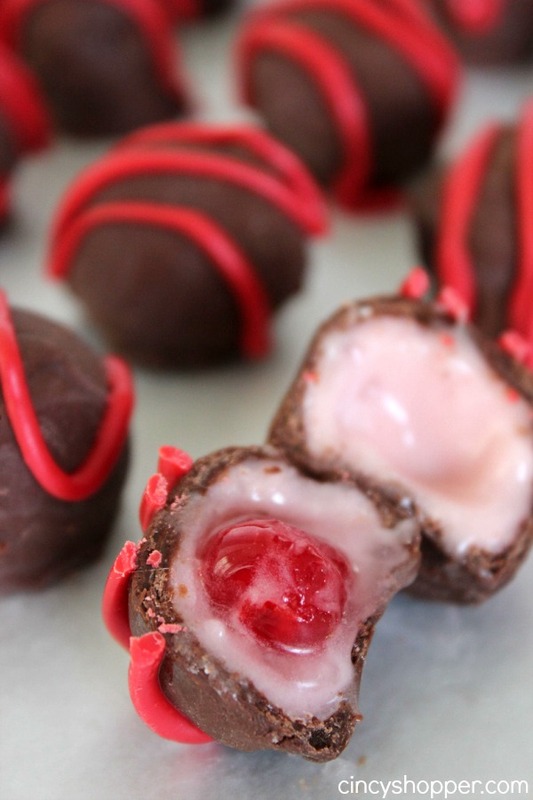 I love chocolate covered cherries, how do you make the red trim on top of the chocolate covered cherries ? These are my favourite , thanks for sharing ! I will running out to buy the supply to get to make these . What is Invertase ? is it like a fondant? Can you really make these without it.? I’m so excited . I have made these for years. I have to make them every Christmas for my parents! I have never used invertase. Even without it the center will liquify after sitting in a tin for about a week. 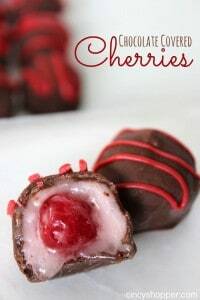 I struggled every year making choc covered cherries with the molds, trying to get the liquid just right and invariably I would have leaks so that when you bit into them all that was left was the cherry. These are sooooooo good and juicy. When you bite into them you truly get that liquid rush. Talk about easy. Plus I couldn’t find that one magic incredient but the recipe worked just fine without it. I have tried to make this twice and the mixture is sticky each time… No success at all,, and the chocolate cover was even worse…what the heck am I doing wrong? My husband even made the 2nd time, and same result? Amy-if the mixture is too sticky just add more powdered sugar. I had to add more to my mixture but once it was the right consistency everything worked perfectly. I just kept adding small amounts of powdered sugar until it wan’t as sticky and I was able to roll it into a ball. Kind of like when you make bread, you have to keep adding small amounts of flour until the dough gets elastic, not sticky. Do you store the finished cherries at room temperature or in the refrigerator while waiting for them to liqiufy? Invertase can be bought online at Walmart for 6 dollars & shipped free.. Its used to help make it gooey & make it look better.